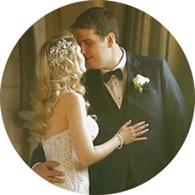 Kristina & Mike started their day with their respective preparation: Kristina’s bride prep was at her home and Mike’s groom prep took place at Toronto’s Fairmont Royal York hotel downtown. Their wedding ceremony at a west Toronto church was sweet and emotional, everyone there was touched by the love between this bride and groom. Their wedding reception was held at the pavilion at Estates of Sunnybrook and it was amazing! When it came to wedding videography, we almost didn’t know where to start first… the decor was stunning, the wedding cake was one of the most spectacular we’ve ever seen… and when the party started, the dancing, the music (both the live band and the DJ), everything was simply amazing.